I'm trying to get AJSA official game support for Heroes of the Storm. Don't just disregard this new game because its "another MOBA" because it's a lot more different than you think. Heroes of the Storm is a MOBA or Dota style game from Blizzard. It is, however, unlike most MOBAs like League of Legends or Dota 2 in that there are no individual hero levels, no cs (creep score) or gold and items. The game has an overall team level earned by getting xp (experience points) across the map and has individual hero talents to change how your hero plays. Heroes of the Storm also has different maps with different map objectives (click here to see the different battlegrounds) that are crucial to succeed in Heroes of the Storm. I created another post about creating a community for this game but I wanted to get everyone's attention to get official game support to enlarge the community so that we can make a team for upcoming tournaments. That post can be found here. Easy to learn basics of the game for newcomers into the community and enough so that they can participate in events that will be held. The Heroes of the Storm e-Sports scene is just beginning and has events being shown on ESPN as well as Twitch. Heroes has a mounts system to help move around the map faster and these can be customized with different variations. Also, SKINS! Each Heroes skins and mounts have different color variations that are earned when you level up the hero. Unlike League of Legends, this game uses a Talent system which allows for different heroes to be played in many different ways. These are unlocked as your team level increases throughout the game. This also leads to each hero having two different Heroic abilities (or Ultimates) to chose from. This makes the game easier to learn and adds a lot of variety to each hero. No last hitting adds helps make the game easier for new players. Experience Points are not only gained by one player but are joined together for a Team level. This XP is earned by heroes or a hero by being in a lane with minions. Heroes has many different Battlegrounds that have special map objectives which help your team to push down enemy structures. These different maps also have an affect on what heroes are picked. Heroes of the Storm has four different types of heroes: Warriors (the tank), Assassins (the main damage dealers), Supports (the main healers) and Specialists (the siege focused heroes). This creates a different mix of classes which brings a lot of variety to the game and creates many possible team compositions. Objective based and team focused game play makes Solo Que a hard and frustrating task sometimes, but hey! more reasons to grow our community! Unlike in games like League of Legends, Heroes doesn't have any skill customization options like Runes or Masteries and only have Hero talents to customize their gameplay. So, come join the Community! 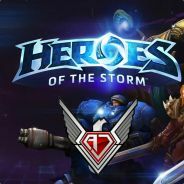 Click HERE to go to the AJSA Heroes of the Storm Community steam group! Here we will post events for both North America and Europe so watch out for those! I play this, hope to be able to play with you guys sometimes. What's nice about this game is that other than the heroic skill (for LoL players this is your R skill and for dota 2 players this is your ultimate) everything is already in your arsenal from the beginning. Meaning you're free to use all your toys from the get go so early game isn't boring at all. I too play this actually lol. I have been waiting for someone to make a post about it. It may be a day or two before we can talk about it but I would like to sit down with you in teamspeak sometime this week to talk about this game. Let me know when you are available and all are welcome to come. The more the merrier. Yea sounds good! I'm free either this coming Friday afternoon or Saturday. WeltonCitan, my nick in this game, play in NA server. Hoping to have some guys to play with, tedious to play alone. There are a bunch of battle tags of EU and NA players on the other post I made that you can play with: HERE! Yes use the other post. This one is meant for official status and things relating to it. If you would like to contribute, you are welcome to. Just an update. I will have no internet this weekend. If you can be on tonight or tomorrow, we can sit down and have a chat about this game. Otherwise, we will need to wait until next week. I should have internet again by tuesday. I played this game since closed alpha. My fav moba. Location: If i'm online, most likely my living room. Haven't played much yet, but it seems interesting enough. So long as Blizzard keeps picking on WoW players for their income enough to keep this one free, i'd enjoy it. One complain I have about this is that you'll never know what map you will get and what heroes you will be teamed up with in Quick Match. There was this one match where I got teammed up with an Illidan, a Valla, a Nova and a Zeratul as Kael Thas while the enemies had an Arthas, Stitches, Nova, Tyrande, Azmodan. While in other MOBAs you can adjust (though most will not), in here it's a surprise at the start. Alright net is up. Logged in to teamspeak. Come chat with me when you can. Theclassybadger and I have talked and he will be the leader for the NA hots group. If you guys want to help out or just play the game, reach out to him for all info related to hots. As for the EU and/or Asian crowd(s), I need someone to step up and lead those two regions (someone different for each) if you guys want events for those regions. At this time NA is the only region we will be playing on until someone steps up for either of the other regions. I will leave this post open for a few more days to field any questions, let you guys post more info, or for people to recommend or volunteer for leadership of one of the other regions. I will then lock and move this thread to completed. I have discussed with TheClassyBadger about HoTS.